These are the best grilling tips that I've given in 3 decades. Simple tips that really help. Learn how to grill the perfect steak, how to grill hamburgers, how to grill chicken and much more. To heat a charcoal grill - you light the coals and wait for them to turn white and ashy, and then cook your food. The wait time can be up to an hour. 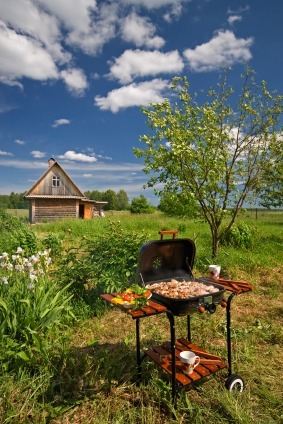 When it is time to cook your food, you can easily adjust the temperature of a gas grill. You can also easily cook foods at different temperatures - depending on the size of your grill. Now to certain extent you can also adjust the temperature on a charcoal grill; but this involves moving all the charcoal to one side of your grill. You still may find that the grill is too hot, so you wait for the coals to cool and by then you may risk that the charcoal is too cool before the food is done cooking. The second thing I considered when purchasing a grill, was the taste. Many folks believe that the charcoal adds a wonderful taste - but other people would argue that gas grilling will give you the same smoky flavor. Do you know what gives the food a smoky flavor? It's not the gas nor the charcoal, it's the fat the drips on the heat source which creates smoke that adds to the flavor. In other words - both will give you great flavor. Gas vs Charcoal grilling? So which one will you choose? That is totally up to you, of course. 1. Prepare the grill according to the manufacturer's instructions for MEDIUM heat. 2. Season the food directly from the refrigerator. The first step in gas vs charcoal grilling is to marinate it. 3. 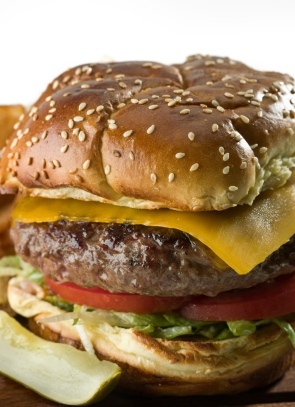 Take the meat out of the refrigerator and bring it to room temperature and THEN grill it. It makes all the difference in the world. Gas vs Charcoal grilling is totally by preference and I hope that I helped you make your decision. First of all - liquid marinades seep in deeper than dry rubs to lend a rich flavor. Plus, the acidic ingredient of the marinade tenderizes the meat. When you purchase your meat and chicken in bulk, use the food-saver and add a steak marinade or chicken marinade recipe before sealing. The food-saver pulls all the air out after it is sealed, so the marinade is sucked into the muscle which means a MORE TENDER meat. This eliminates marinating chicken or marinating steak just before grilling - bring the meat to room temperature and start grilling. The container you use for this steak marinade or chicken marinade recipe is critical. Use a glass, plastic, stainless steel or ceramic dish for marinades. Aluminum and some other metals react with acids and will affect the flavor. Use a steak marinade recipe for tougher cuts of meat like tri-tip, flank steak, London broil, skirt steak, and beef ribs. They benefit tremendously when the steak marinades over night. These tougher cuts of steak are also economical to purchase and now you can save money without sacrificing flavor. 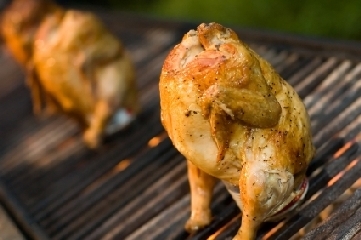 Rub the grill grate with an onion and this will make them non-stick. Just cut one in half and rub away. Deep frying Turkey, grilling fish, smoking meat, and grilling turkey or grilling pork without brining the meat first is costing you the taste of what could of been a beautiful, succulent bird or moist dreamy chops. One tip I use to brine turkey is to use a large cooler or a clean bucket and keep in the garage overnight in the winter - or use a large stock pot, or a large turkey roasting bag to brine in the summer. Combine in a food processor or blender. Season with kosher salt and freshly ground black pepper to taste. Place on a hot grilled steak before serving. I offer more than grilling tips. Please check out more grilling must-dos below.